Superior outcomes require superior competitive skills. Studies show CEOS and Owners who implement effective Advisory Boards have higher rates of sustained success. Advisory Boards can help CEOs accelerate growth, improve financial performance, manage risk, extend market reach, uncover new markets and enhance operational performance. Lismore’s CEO created our Advisory Board Approach around a clear metric of success. Over the past 20 years, Lismore successfully built Advisory Boards for a diverse spectrum of clients across the world – designed to address specific needs of private and public organizations. No matter what your industry or the size of your business, whether public or private, Lismore can help you build an Advisory Board tailored to your needs. Proven Lismore approach designed with your success in mind. Our team stays with you from initial design until a smoothly functioning Advisory Board is in place. We assign an experienced Lead Director who partners with the CEO and teaches the Company to fully maximize the competitive potential their Advisory Board brings. 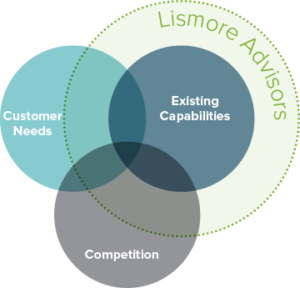 Lismore’s proven 4 phase approach ensures your advisory board can deliver game-changing results for your business. One size only fits one, so we work with your business and develop a tailored board profile that fits your unique objectives. We know how to get an in-depth understanding of your company and translate it into a competitive asset profile. To do this, we often utilize our Advisor Network to broaden our lens on industries or functional perspectives which bring unique competitive perspectives to your team. Lismore’s Lead Director works with the CEO to craft the board agenda. We manage the regular activities of the Advisory Board, including gathering content for meetings, calendar, logistics, pre/post meeting information and leading Advisory Board meetings. We’ll even handle the meeting minutes. Lismore’s well-honed vetting process identifies essential traits for members of your Advisory Board. We help to source, interview and select candidates. Our Advisor base of 400+ seasoned executives allows Lismore to quickly access talent that is relevant to your needs. There is nothing more consistent than change. Working with the CEO, Lismore’s Lead Director will guide the company on refining the original design and structure until it is in sync with the strategic direction of the company. At the end of the first cycle, this will also involve transitioning the board into the hands of the company and a new Lead Director.